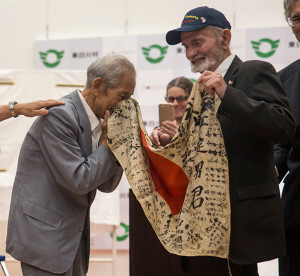 Tatsuya Yasue, left, receives a flag from World War II veteran Marvin Strombo at Higashishirakawa Village, Gifu Prefecture, Japan, Aug. 15, 2017. Tatsuya, along with other members of the family have waited over 70 years for the return of the brother they lost during the war. The ceremony provided both families with closure as they finally have a part of Sadao Yasue to bring home. The reunion was made possible by the Obon Society of Astoria, Oregon. The ceremony also took place during the Obon holiday in Japan, a holiday dedicated to going back to the place of origin of one’s family and spending time with one another. Deep within the mountains of Gifu prefecture, in a small farming village hidden away from the fast-paced city life, the family of a Japanese soldier, lost in World War II, eagerly waited for the return of a precious heirloom. For the first time in 73 years, the Yasue family can finally receive closure for the brother that never came home from war. Marine Corps veteran Marvin Strombo traveled 10,000 miles from his quiet home in Montana to the land of the rising sun to personally return a Japanese flag he had taken from Sadao Yasue during the Battle of Saipan in June 1944. For decades after his time as a scout sniper with 6th Marine Regiment, Second Marine Division, Strombo meticulously cared for the flag and never once forgot the promise he made as he took the flag from Yasue in the midst of war. As a young corporal, Strombo looked up from his position on the battlefield, he noticed he had become separated from his squad and was behind enemy lines. As he started heading in the direction of the squad’s rally point, he came across a Japanese soldier lying motionless on the ground. As years went on, Strombo remembered his promise to one day deliver the heirloom. He found a way to the Yasue family when he discovered the Obon Society of Astoria, Oregon. Through the coordination of the Obon Society, both families got the chance to meet face-to-face to bring what remained of Yasue home. Sadao’s younger brother, Tatsuya Yasue, said his brother was a young man with a future. When Sadao was called upon to go to war, his family gave him the flag as a symbol of good fortune to bring him back to them. Getting the flag back means more to them than just receiving an heirloom, it’s like bringing Sadao’s spirit back home. Tatsuya was accompanied by his elder sister, Sayoko Furuta, and younger sister, Miyako Yasue, to formally accept the flag. As Tatsuya spoke about what his brother meant to his family and his community, he reminisced over the last moments he had with him before his departure. Tatsuya said his family received permission to see Sadao one last time, so they went to him. He came down from his living quarters and sat with them in the grass, just talking. 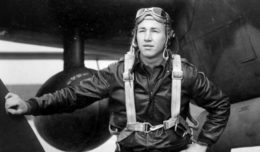 When they were told they had five more minutes, Sadao turned to his family and told them that it seemed like they were sending him to somewhere in the Pacific. He told them he probably wasn’t coming back and to make sure they took good care of their parents. That was the last time Tatsuya ever spoke to his brother. Strombo said he was relieved that, after all these years, he was able to keep the promise he made on the battlegrounds of Saipan. The reunion took on special meaning as it took place during the Obon holiday, a time where Japanese families travel back to their place of origin to spend time with loved ones. Although Strombo never fought alongside Yasue, he said he regarded him as a brother-in-arms. They were both young men fighting a war far from home. He felt an obligation to see his brother make it home, back to his family, as he had made it back to his own. Strombo stayed true to his word and honored the Marine Corps promise to never leave a man behind.